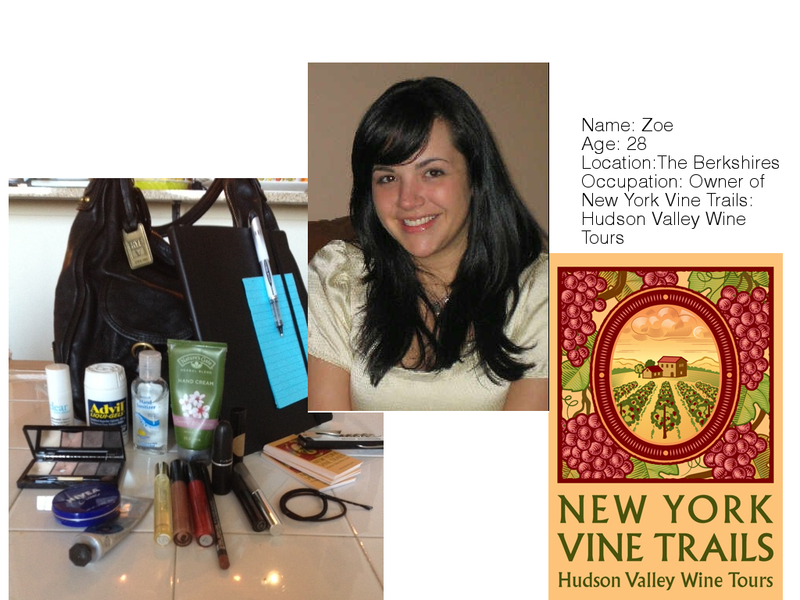 Earlier this week Zoe, of New York Vine Trails let me take a peek inside her bag. Enjoy! I like to have a ton of options so I pack as much as I can into a sturdy (and big) bag like this Frye one. I have several lip gloss & chapsticks, stains, lipsticks and liners because thats one thing I am always reapplying. + SEPHORA COLLECTION– #25 but it doesn’t look like the color on their website, looks closer to 20 or 43. Very easy in a flash for some color and shine. Liquid Black Eyeliner – in the event that I need to look less bummish in a flash – darkening my lash line with this helps me look more put together. + CLINIQUE– Almost Lipstick – Chic Honey. This is my perfect color, not too thick, nice berry color which makes your lips look flushed with out looking like you have lipstick on. +ChapStick- Small & Wonder Lip Balm, Untinted peppermint & honey – for obvious reasons it smells great and keeps my lips from getting cracked and dry. + Nature’s Gate– I always have multiple hand creams, they are security blankets and the process of applying them and smelling them not only helps to keep my hands and cuticles from cracking but is very soothing. This one is paraben free and I picked it up at my local ‘fresh market’ upstate New York’s answer to Whole Foods. It has a very mild scent that is very clean and slightly floral and a nice quickly absorbed texture. +Nivea Creme– I always have one or more of these on hand or in my car. They’re cheap and the texture, smell and moisturizing abilities is fantastic. + L’Occitane– Its a great lotion with an incredible smell and I love the little tubes, great for traveling. + Bobbi Brown Compact– (colors: Bone, Naked, Velvet Plum & Espresso) This is a well worth it compact. I received it as a gift from my mother, who prides a neutral compact “every woman should have one on hand.” The little brush it comes with has a liner brush on one side that has saved me many a morning applying make up in my car or on the train. The colors compliment nearly every complexion and it lets me do double duty by always having a mirror on hand. ** I don’t think they make it anymore but the colors are above. + Philosophy Clear Days Ahead – emergency zit care… it goes on clear & works great to shrink zits. + Boyfriend Perfume Roll On– I love this scent, its musky, spicy and vanilla scented. Great in a snap when I’ve forgotten to spritz myself before leaving the house. + Extras: Always a wine opener, my moleskin soft lined notebook, pens, post-its, hair ties, bobbi pins & business cards. Category: Body, Eye Products, Face Color, fashion, Hair, Lip Products, Luxe, Perfume, Skin Care, Style, What's in my bag Wednesday Tagged: beauty, Bobbie Brown, Boyfriend Perfume, clinique, fashion, Frye, L'Occitane, MAC, Moleskin, Nature's Gate, New York Vine Trails, Nivea, Philosophy, post-its, sephora, Small & Wonder, stila, Whats in her bag?